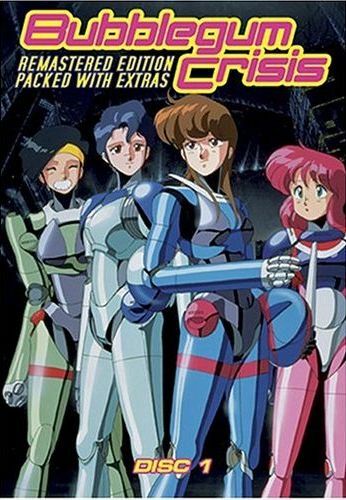 AnimEigo describes Bubblegum Crisis (BGC to its fans) as The Japanese Animated Cyberpunk Classic. Personally, I wouldn't go so far as to call it cyberpunk, at least in the Gibson variety of the genre, but it is definitely a high-tech, near-future story. The series begins in MegaTokyo of the year 2032, where much of the city has recently been destroyed by the second great Kanto earthquake of 2025. In the process of rebuilding the city, the Genom corporation has become a major world power, due to its introduction of boomers. Boomer technology is essentially a combination of robotics, cybernetics and artificial intelligence in human form, pioneered by Doctor Katsuhito Stingray. Doctor Stingray was killed in a lab accident shortly after initial development was completed, but Genom has continued work on his brainchild, and boomers are now a major segment of the worldwide manual labour and military hardware market. Boomers are quite obviously inspired by the replicants from the movie Bladerunner, and the series has many direct references to both Bladerunner and a number of other western entertainment icons. Noteworthy among these are some subtle (and not-so-subtle) animator's jokes and recurring arguments among fans as to whether or not Sylia is a boomer. The above is the official, surface description of life in the 2030s. In reality, Genom is far from the saviour of the world that they would project themselves to be. Genom's development of military boomers, and their continuing program of controlling the global economy and government poses a threat to the very future of humanity. In response, Doctor Stingray's daughter, Sylia, formed the Knight Sabers to resist their plans in ways that the police and world governments could not. 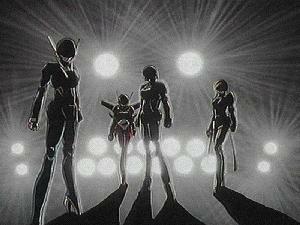 The above description came from Brian Edmond's Bubblegum Crisis page, and was edited by yours truly (contact me).